Let's be utterly frank for a moment, the AGP slot's days are numbered. That being the case, there are still many millions of AGP motherboards in the world, while virtually no computers in the hands of consumers use PCI express yet. It may be some time before the balance swings in favour of PCI Express, so videocard manufacturers are continuing to produce their products for consumers looking to upgrade older machines. After all, it is all about playing the games we like at the best possible visual quality isn't it? 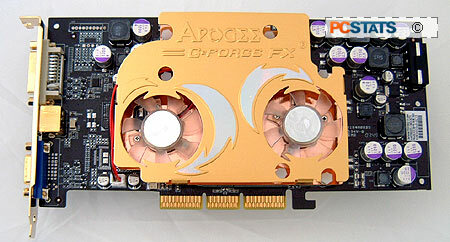 Mainstream graphics cards are often talked about in publications, and while the industry slang is an accurate depiction of the FX57000 videocard, I'm sure most consumers are really only interested in improving the FPS and appearance of their game, for the most economical outlay of cash. In that respect, the nVIDIA GeForceFX 5700 and GeForceFX 5900XT class videocards bode well. Chaintech, while better known for their motherboards, have been selling nVIDIA videocards for quite some time now, and now have found GPUs worthy of the high-end Apogee brandname. When you first look at the Chaintech Apogee AA5700U, you get a feeling that the card really is something special; the AA5700U is definitely one of the best looking videocards on the market. 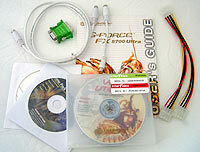 Chaintech bundle plenty of goodies with the AA5700U videocard, including a full version of Commandos 3, a five game demo CD, WinDVD, WinCreator, WinRip and WinProducer software. Because the supports TV-Output as well, Chaintech include a S-Video-to-S-Video cable as well as a S-Video-to-Composite converter. Lastly we cannot forget the little green DVI to analog converter. Other than a different coloured PCB and a custom cooling solution, it should be clear that Chaintech have based the Apogee AA5700U on the nVIDIA reference GeForceFX 5700 Ultra reference design. Instead of using one large noisy fan however, Chaintech equip the Apogee AA5700U with two smaller 40mm blue LED fans which are much quieter. Those of you who are sensitive to noise will be happy to know that the AA5700U is near silent during operation, even in 3D mode! Chaintech say that the copper GPU HSF will keep the core up to eleven degrees cooler than a card equipped with the reference HSF (when the card is running at full load). That's quite a claim, and from our tests the AA5700U did seem to run a bit cooler, not eleven degrees... but four to five degrees Celsius cooler when the card is under full load. 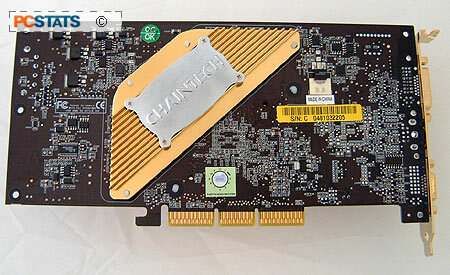 The rear of the AA5700U videocard is covered by a large passive heat spreader designed to cool the memory.